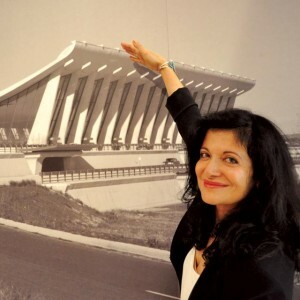 I had the wonderfully distinct honor of recently interviewing Mina Marefat, Ph.D., AIA, the curator of the "Eero Saarinen: A Reputation for Innovation" exhibition currently on display at the Museum of Design Atlanta (MODA). Dr. Marefat and I talked via telephone—she's in Washington, D.C. where she is a professor at Georgetown University. She earned her Ph.D. at MIT and a Masters at Harvard. She has one incredible resume! And she's incredibly enthusiastic about Eero Saarinen. 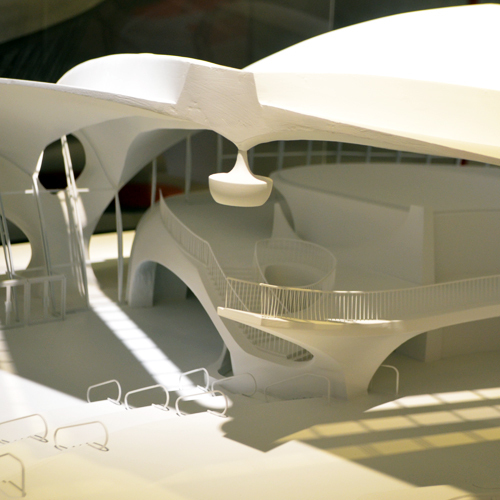 In fact, it was her tenacious enthusiasm to learn and discover everything she could about Saarinen that led to the saving of some of his most innovative and influential work—the winning design for the Smithsonian Gallery of Art in Washington, D.C. that was approved but never built, a project lost to war. The story resounded of Hollywood. Dr. Marefat, after a long and arduous search for Saarinen's drawings of the Gallery of Art—a 1939 competition that he won—received a frantic phone call. The drawings had been found...but they were slated to very soon be destroyed. She learned this at 4:00 p.m. on Thanksgiving Eve! She requisitioned a car—jumping through painstaking hurdles to get it—and drove to Suitland, Maryland, to collect the drawings. The 1 by 1.5 meter board filled with Saarinen drawings was one of the most beautiful sights Marefat had ever seen...it was a dream come true—her dream..
Forgotten by history for 50 years, on the verge of imminent destruction, Dr. Mina Marefat saved priceless works of her design hero, also a favorite of many, many design enthusiasts around the world. Still, the exhibition almost didn't come to be. Already curated by Dr. Marefat, it still takes sponsors to produce a traveling exhibition. Once it was to be included in a larger exhibition, but was disappointingly left out. Later, she had other sponsors lined up, but then the economy tanked, creating further delays. Fortunately, the exhibition is now making its way around the country to the great delight of design enthusiasts. So, why are these drawings so important, you ask? (and they're on display at MODA, by the way) According to Dr. Marefat, the Smithsonian Gallery of Art competition of 1939, was one of most important design competitions in the country's history, only second to the Chicago Tribune Tower competition. 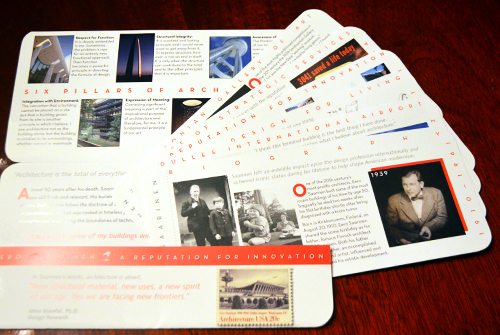 Even though Saarinen's building was not built, he did spent every penny of the $7,500 prize money to build a model. His work on this building still carries significance and influence. And fans and admirers wonder what today's architecture design landscape—not to mention city skylines—would look like had he not tragically died of a brain tumor only two weeks before his 51st birthday. Dr. Marefat and I talk for about an hour...mostly about Saarinen, but also about Washington, D.C., where I used to live and volunteered (Smithsonian Museum of Natural History and the Smithsonian National Air & Space Museum) and was a frequent visitor to other Smithsonian museums, as well as the Library of Congress and the National Gallery of Art, all three of which she worked in for a number of years. When asked what about curating this exhibit did she enjoy the most, Dr. Marefat said that it was the "original research, discovering extraordinary things about such a masterful designer." She went on to explain that it's a growing exhibition. Something has been added with each city it visits. 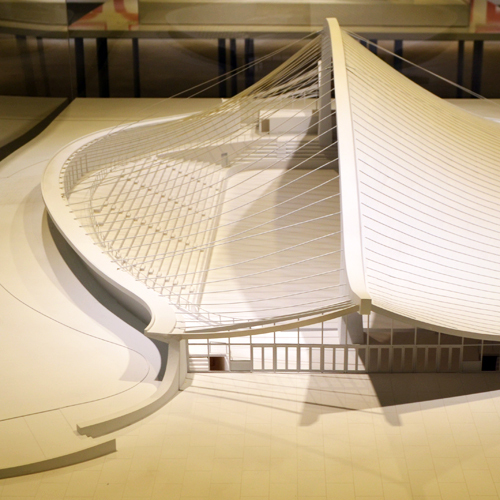 The MODA show picked up some models of Saarinen structures—and they're brilliant! Dr. Marefat and I also discussed the staying power of Mid-century Modern design. We agreed immediately on the power of Hollywood, current television shows like Mad Men, museums like the Museum of Modern Art in New York (and of course MODA), but she also talked about critics. 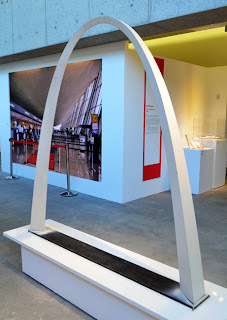 When Saarinen was creating what today we know to be masterpieces, there were critics who thought he was going way too far "outside the box" with his designs. Dr. Marefat explained that "enough time has passed that those arguments no longer have teeth" thus the opportunity for Mid-century Modern's following to continue to flourish. The titles of the Pillars alone speak for themselves, but the exhibition wall and the companion boarding passes explain each in greater detail. I think that's one of the other things that I love about this exhibition. It's considerably more than a collection of artifacts...it tells the story of Saarinen's message and philosophy of architecture. The Museum of Design Atlanta (MODA) is holding Mad Men closing party for the exhibition this coming Saturday night, June 29. Dr. Marefat is arriving that evening and hopes to join us for the party, but if she doesn't make it then, she'll definitely be at the Museum on the exhibition's final day, Sunday, June 30. So, you still have time to see the show. It's masterfully executed and demonstrates the irrefutable significance of Saarinen's contributions to design—architecture and furniture. A special "Thank you!" to Dr. Mina Marefat for creating this exhibition, for further developing my enthusiasm for architecture, and for making time to talk with wanderlust ATLANTA. See you later this week!